2018 marks the 30th anniversary of public radio’s Peabody Award-winning Afropop Worldwide—a weekly radio program, website and podcast series that reveals the essential music and stories of Africa and the African diaspora—the roots of the world’s greatest pop music traditions. 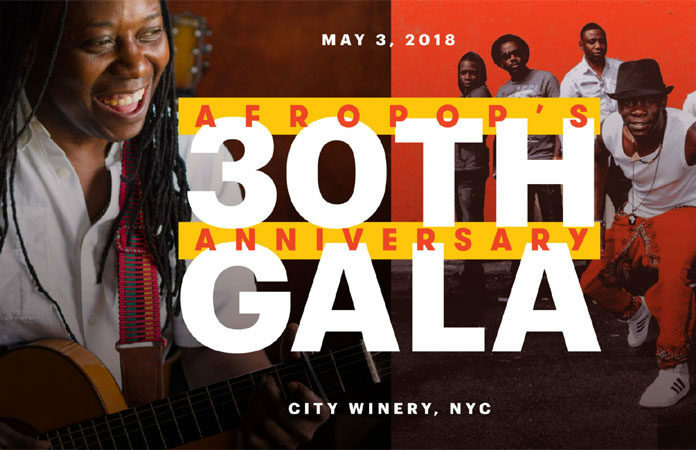 Artists, staff, fans, leaders in the media, business, technology and philanthropists will come together to celebrate Afropop’s 30th anniversary at a gala benefit at New York’s City Winery on May 3. Honorary Co-Chairs include Harry Belafonte, Angelique Kidjo and Bonnie Raitt. A central feature of the gala is the 2018 edition of the Afropop Hall of Fame. Inductees into the Afropop Hall of Fame are chosen for their artistic excellence and their significant roles in connecting Americans to Africa. Past inductees include King Sunny Ade, Youssou N’Dour, Oumou Sangare, Angelique Kidjo, Habib Koite, Harry Belafonte, Oliver Mtukudzi and Thomas Mapfumo. This year’s inductees are Garifuna legend Aurelio Martinez and the most dynamic band out of Zimbabwe in the past decade, Mokoomba. Both acts will perform at the gala. Afropop Worldwide has taken listeners on audio journeys to some 50 countries and introduced them to thousands of brilliant artists, thus building an international market for their creativity. Since 2003, the roster has also included a unique subseries of Hip Deep programs, which use music as an entrée into deeper subjects of history, religion, politics and identity in our fast-paced, globalized world. The radio program is distributed by Public Radio International to over 100 stations nationwide, and is available on SoundCloud and at afropop.org. Afropop’s radio footprint is particularly strong in the greater New York area: New York City and northern New Jersey on WNYE, 91.5 FM, Mon.-Sat. 5 a.m. and 11 p.m.; Connecticut, WNPR, 90.5 FM, Saturdays, 11 p.m.; Hudson Valley, WAMC, Sundays, 4 p.m.
Afropop’s hour-long radio programs are also available as podcasts. Since 2015, an additional set of shorter Afropop Closeup podcasts have provided our talented producers a platform for narratives about the circumstances, events and characters that surround the world’s most exciting and soulful music. On May 3, Afropop host and legendary broadcast veteran Georges Collinet will be on hand to greet gala attendees, along with Afropop’s founder and executive producer, Sean Barlow and senior producer/editor Banning Eyre, and other members of the extended Afropop family. Singer/songwriter, guitarist and bandleader Aurelio Martinez is one of Central America’s most electrifying performers. Born in Honduras, Aurelio is gifted with a spectacular voice and irresistible charisma. He is also the major living tradition-bearer of Garifuna culture and music—nothing less than the Cultural Ambassador of the Garifuna Nation. Garifuna are people of Amerindian and West African descent who live along the coasts of Belize, Guatemala, Honduras and Nicaragua. Aurelio first learned to sing from his musical mother, who crafted many of the songs he performs today. In 2004, Aurelio released his first solo album Garifuna Soul—immediately flagged by Afropop as the discovery of that year. In 2006, he became the first Garifuna member of the Honduran National Congress, but he found that music, rather than politics, was a more effective way to advance the Garifuna people. In 2008, the Rolex Mentor and Protégé Arts Initiative Aurelio awarded him a year-long mentorship with Grammy Award-winning Senegalese legend Youssou N’Dour. With Youssou, Aurelio spent time in Africa for the first time, an experience that deeply enriched his innovative musical creations and fortified his mission to reinvigorate Garifuna culture. Says Aurelio, “We’re not going to let this culture die. I know I must continue my ancestors’ legacy and find new ways to share it with the world.” Afropop’s 30th Anniversary Gala proudly salutes this extraordinary mission and its greatest champion. Mokoomba is one the most exciting bands to come out of Africa in the 21st century. This explosively talented six-man crew from northern Zimbabwe has toured over 40 countries on five continents, and performed at the world’s most prestigious international festivals and venues, including New York’s Apollo Theater. Zimbabwe’s best-known musical icons, Thomas Mapfumo and Oliver Mtukudkzi, exemplify the culture of the country’s Shona majority. But Mokoomba’s music is rooted in the Tonga, Luvale and Nyanja rhythms and melodies from Victoria Falls, where these six grew up together, friends since childhood. 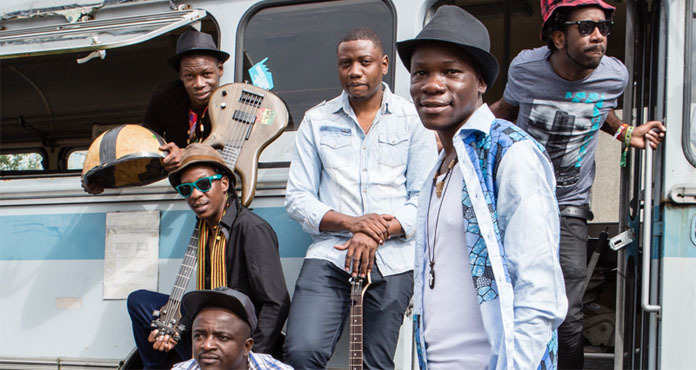 Mokoomba’s signature sound is a mix of indigenous elements—including stirring songs from boys’ initiation ceremonies—and influences from modern regional styles, such as Congolese soukous and South African vocal polyphony. Their two albums—the fiercely electric Rising Tide (2012) and more acoustic and rootsy Luyando (2017)—have garnered universal acclaim. But nothing compares to the band’s kinetic, choreographed stage show, centered around mesmerizing lead singer Mathias Muzaza. Mathias can coo and croon, growl like a dancehall braggadocio, toss in a little falsetto and vibrato or soar into his full-throated, leathery smooth tenor reminiscent of Salif Keita, in a West African griot’s wail. Mokoomba’s exclusive New York City performance at Afropop’s 30th Anniversary Gala is guaranteed to fill the dance floor in an ecstatic culmination of this once-in-a-lifetime celebration.